Its unique bill produces powerful splatter, spit and bubbles that appeal to the fish. A body designed for air-resistance reduction, and tungsten weights at the very end of its tail guarantee incredible distance even against head winds. It can now search a much wider area with just one cast. Excellent body balance allows it to make quick consecutive turns without jumping out of the water, making it move much like agitated bait fish chased by a bass. The bait readily triggers the fish to bite. The feather hooks attached to the tail serve as resonance in the intervals between stillness and motion of an action, take those light bites of a fish unable to break above water into full-on bites, and help support the hooks suction. 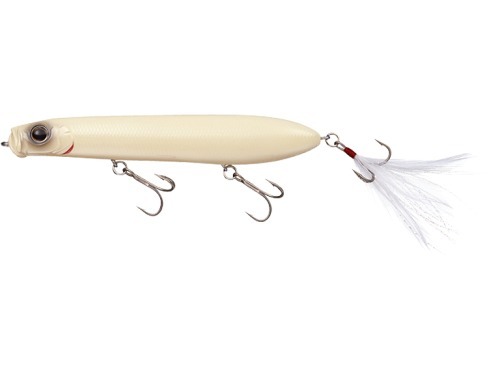 On the other hand, the resistance created by the feather hooks has the effect of producing more sharpness to the baits quick turns. Whether to attract far-away fish with dramatic action, or nervous fish with soft vibrations, the SB-125 is the one tool that can handle it all, regardless of any change in the day-to-day conditions of the fish. Make SB-125s outstanding abilities a part of your repertory. 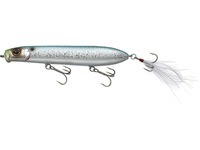 American Shad 4 7/8 in. 15/16 oz. Blueback Herring 4 7/8 in. 15/16 oz. Bone 4 7/8 in. 15/16 oz. Emerald Shiner 4 7/8 in. 15/16 oz.